Customer Experience is undergoing big changes as more and more brands work toward the ultimate customer engagements. Industry experts have their vision for what the ideal Customer Experience initiative looks like and what is trending now in the CX world. Jeanne Bliss is the Founder and President of CustomerBliss, and the Co-Founder of The Customer Experience Professionals Association. Bliss feels that “CX falls short today by focusing on the mechanics: journey mapping, touchpoints, survey work, and other tactics. Companies are doing the busy work but they’ve lost the real meaning of what CX should be.” Her book, Would You Do That to Your Mother is available now. Lightico, a customer experience enterprise software platform, contends that most consumers still prefer to receive agent-assisted help when in need to complete a complex task or process. This last leg of the journey, aka the Last Mile, is often times long, painful and full of friction. A bad experience in the Last Mile can completely diminish the great experiences that have led to it, leaving the customer frustrated and dissatisfied. It’s only in the critical last mile of the journey that customers directly interact with the business at a point of sale or critical point of contact (sales forms, renewals, loan applications, insurance claims, debt collection, billing disputes, etc). As customers engage with brands, they formulate their opinions based on these limited direct business interactions. 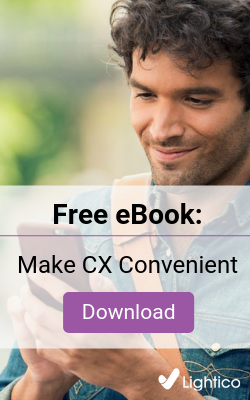 The future of CX will be based on customer convenience, personalization and stronger C-Level support at businesses that are serious about great customer relationships. It will be interesting to see to which, and to what extent, these new innovations will find their way into businesses next year.